Philadelphia: Sanford, Everts & Co, 1872. Good. 127 pages color maps 42 cm. Folio. Original brown cloth, gilt title, rebacked in modern leather. Japanese paper repair to boards. Soiling to title page. Soiling to map margins and foxing to maps. 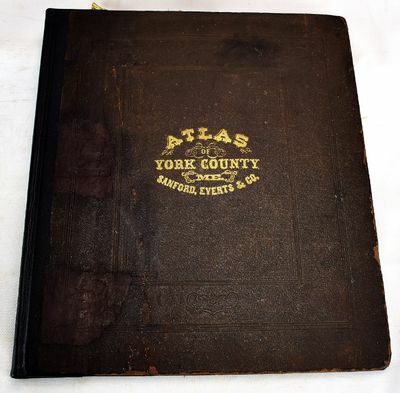 This atlas has colored maps of the towns and villages of York County, Maine plus brief histories of the towns. Most of the maps also have business directories listing attorneys, manufacturers, merchants, etc. This is an oversized or heavy book, that requires additional postage for international delivery outside the US.